Secondary hazards occur as a result of the primary effects. Primary hazards include ground shaking, landslides (a downward sliding of a dry mass of the earth either from mountains or cliffs), liquefaction (when the soil is reduced to a liquid) and surface rupture (breaking of the surface along a fault). Ground shaking causes building walls to crumble, causing injury to people, blocking sidewalks and streets and shutting off electricity. 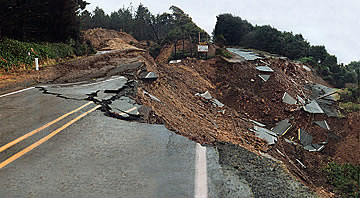 Liquefaction is when soil and groundwater mixes. The ground becomes very soft, similar to quicksand. It can cause the foundations and supports of buildings, bridges, pipelines, and roads to sink into the ground, collapse or dissolve. When liquefaction occurs, the strength of the soil decreases and the ability to support foundations for buildings and bridges is reduced. This is why it is always a better idea to build on bedrocks rather than soil. If it is necessary, then improve the soil and its strength. Landslides, especially in water saturated soils, causes falling rocks and debris that provide injury to people, buildings, vehicles and block roads. Surface rupture is when the earth's surface breaks. It causes permanent damage and cannot be turned back into normal. Examples are roads cracking and grass and soil splitting into two. During an earthquake, shaking is not all that happens. There are side effects that happen after the primary hazard has taken place. Some are even more dangerous than the earthquake itself. Secondary hazards can also affect neighbouring countries of the country that experienced the earthquake. Secondary hazards include tsunamis, fires and seiches. A tsunami is a series of waves. It floods everything in their way. Tsunamis can injure or kill many people and cause significant damage to buildings and other structures. It also causes flooding. Fires can be started by broken gas lines and power lines, or tipped over wood or coal stoves, as a result of the earthquake. For example, after the Great San Francisco Earthquake in 1906, the city burned for three days. Most of the city was destroyed and 250,000 people were left homeless. Seiches are like small tsunamis. 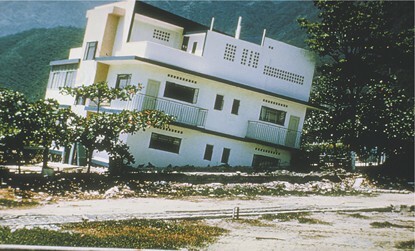 They occur on lakes that are shaken by the earthquake and are usually only a few metres high, but they can still flood or knock down houses, and tip over trees.